Reader, I have been corrupted over recent weeks – not once but twice! My mind has been disturbed by filth of such depravity that it is little wonder Her Majesty's guardians of morality and taste pursued it through the courts. 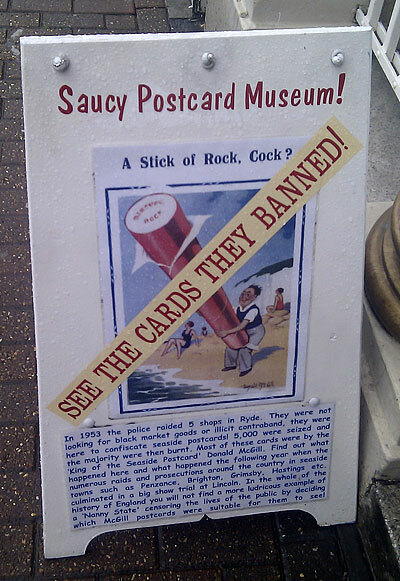 I refer to the saucy seaside postcard. And in reality, the fact that such honest vulgarity was prosecuted as obscene is as much of a joke as any on these colourful cards. The Pie Factory Gallery in Margate hosted an exhibition called I Wish I Could See My Little Willy which featured cards deemed too rude to view by committees of taste and decency on local councils across the country in the 1950s. Above: a lifesize cut-out at the Pie Factory Gallery based on Bob Wilkin's postcard "I wish I could see my little Willy"
The excellent exhibition was run in conjunction with the British Cartoon Archive and many of the cards, by the acknowledged master of the genre Donald McGill, and by other artists, were displayed along with their obscene-publications index cards. An interesting story emerges, showing how ideas of obscenity are subjective. Often what was seen as mucky in Margate was not seen as rude in Ramsgate, just a few miles down the road. And vice versa. 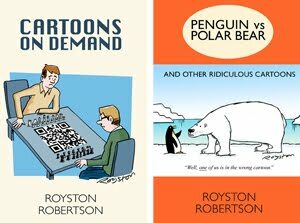 On the day I visited, there was an excellent free talk and slideshow by Nick Hiley, curator of the British Cartoon Archive, which is based at the University of Kent in nearby Canterbury. The talk was about the various prosecutions around the country and, ultimately, the show trial of McGill in Lincoln. It was held in the old magistrates’ court, now the Margate Museum, and Dr Hiley spoke from a witness box on caster wheels. 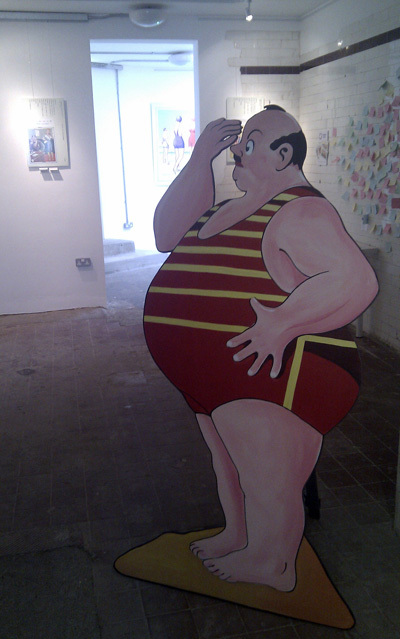 The Margate show is, alas, over, but for a permanent museum dedicated to Donald McGill head over to the Isle of Wight. I was there on holiday the week before my Margate excursion so I popped over to Ryde to see the Donald McGill Postcard Museum, which opened last year. “Museum” may sound a little ambitious as it’s one room, albeit very grand one, behind a café, but boy do they make good use of the space! 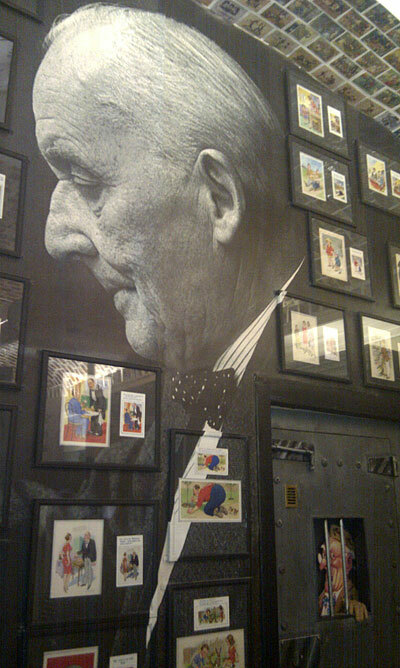 There’s lots too see – not least the impressive sight of postcards all over the walls and ceilings like a huge mosaic. Plus there’s original art, letters, promo material and more. So give yourself a couple of hours if you visit. The museum shows that McGill's work was not always saucy and about the seaside. His career ran from 1904-1963 and spanned two world wars, so it's quite a reflection of changing times and, of course, there are lots of propaganda cards. It’s fascinating to see that a lot of his Hitler cards were “recycled” jokes about the Kaiser! Also on show are some early drawings from the unpublished Grown Ups’ Nursery Book. It’s also very playful exhibition, there’s a police van, with the registration F1 LTH, carrying boxes of confiscated stock, a life-size postcard that you can be part of, and even five joke exhibits – fakes that you are invited to spot. I won’t ruin the fun and reveal them. When you've finished looking round, to prove that this is truly the art of the people you can even buy original-issue McGill postcards for no more than a few quid each. The Donald McGill Postcard Museum is at 15 Union Street, Ryde, behind the Orrery Café. It is open seven days a week, March to the end of October, from 10am. Last admission 4.15pm. Admission £3.50 or £3 for “Ancient Britons” and £1.50 for kids. No problem, Mike, and thanks for linking to my post.